Jonathan Neumann’s new book To Heal the World? 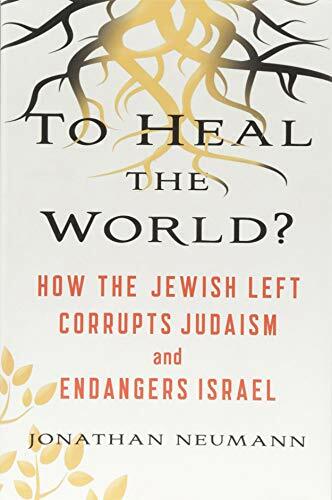 : How the Jewish Left Corrupts Judaism and Endangers Israel is a scathing analysis of the pseudo-religion of “tikkun olam” — the idea of “repairing,” “fixing,” or “healing” the world. Its unifying thesis is that the concept has no basis, textual or historical, in Judaism. It was created, he argues, virtually ex nihilo by Jews who had abandoned their religion, but remained skilled in assuming the long robes and long faces of Biblical prophets (whom they consider charter members of the Tikkun movement). “The major Jewish denominations [have] officially adopted tikkun olam to describe their existing social justice programs, and today it has totally taken over American Judaism,” Neumann writes. Do-gooders who tend to confuse doing good with feeling good about what they are doing, the Tikkunists pervert religious texts and rituals to serve the ends of liberal politics, very often liberal politics in its most blatantly illiberal, dogmatic, and dictatorial forms. When Barack Obama embraced and lavishly funded the genocidal Iranian regime bent on obliterating Israel; or Bernie Sanders, fatuously declaring “pride” in his “Polish” background, insisted that, in these dark times, the American Dream could be fulfilled only in Venezuela; Jewish devotees of world-healing became their most ardent supporters. How did “tikkun olam” achieve its present status as a clarion call to Jewish liberals seeking divine endorsement of their political desiderata and prejudices, ranging from socialism to environmentalism to transgenderism — the revolution du jour? The textual basis for tikkun olam, Neumann points out, is slender and ambiguous. It is nearly non-existent in the Bible, but can be found in the aleynu prayer, and observant Jews are familiar with it. But is it really an endorsement of, for example, the Democratic Party’s policies on immigration, abortion, and Israel/Palestine? The first paragraph of the aleynu, Neumann points out, recounts the greatness of God and His special relationship with the Jewish people. The second promises eventual divine sovereignty over the whole world. But here arises a problem for the Tikkunist world-healers. Although they lifted the notion of tikkun olam from this very prayer, many of their leading rabbis do not allow its recitation by their congregations. Why? Because the second paragraph seems to look forward to the Kingdom of God, but — an unthinkable embarrassment for devout tikkunists — this is the God of Israel, not of the Unitarians. They are eager for perfection, to be sure, but by means of the liberal agenda, to be imposed by Jewish liberals and their gentile comrades. After a short, indeed disastrous, academic career at the University of Washington, where he organized an anti-Mormon riot, Lerner turned Tikkun into a welcoming home for countless believers in tikkun olam, who in some cities conducted seminars to explore his “ideas.” But what brought him to national prominence was the zeal with which he hailed the Palestinian cause from within the Jewish community. He also was quickly afforded space by The New York Times to tell how the voice of progressive Jews like himself had been “stifled” by the Jewish leadership. Later his stifled voice moved into the White House to whisper in the ears of Hillary Clinton. Among Berkeley Tikkunists, Lerner’s primacy in Israel-hatred was usurped by Judith Butler, whose stupefyingly opaque prose (she has been awarded a prize for “worst academic writing of the year”) gives her an unfair advantage over him at the universities. Indeed, she may outdo all Tikkunists in her hatred of Israel, has been hyper-active in countless agitprop schemes, supported BDS, and at times belatedly regretted signing some anti-Israel petitions because they “failed” to call for the elimination of Zionism itself. And why not, since “Israeli citizens” are becoming “a people of camp wardens”? But at Berkeley, where competition is stiff, even she is outmatched in the use of the Israel-Nazi equation by a fellow academician — a professor of Talmud named Daniel Boyarin. Neumann’s book is essential equipment for anyone entering the conflict of ideas over the current decline of American Judaism and its consequent separation from Israel, which just happens to be the Jewish Third Temple. But it has one serious omission. The most important book on this matter of tikkun olam is barely mentioned, and doesn’t even appear in the index. This, of course, is philosopher Emil Fackenheim’s To Mend the World: Foundations of Future Jewish Thought. For Fackenheim, the world which had destroyed European Jewry was indeed in need of major repair, but — as I often heard him bitterly lament in his Jerusalem flat — “that clown Lerner has brought the term into disrepute.” For Emil a healing could come only with the foundation and survival of Israel, and indeed it had come. “What then,” he wrote in 1982, “is the Tikkun? It is Israel itself.” The ability of the Jewish people to create the State of Israel just a few years after the destruction of European Jewry is one of history’s greatest affirmations of life against death, a sign of hope for all humanity. Once upon a time, even American Jews understood that. Edward Alexander is Professor Emeritus in the Department of English at the University of Washington. His most recent book is Jews Against Themselves.